Analysis of previous findings and a targeted investigation scope has helped inform the client’s evolving masterplan and form part of the site marketing particulars for specific areas of the re-development. This will enable prospective bidders to understand ground characteristics and enable decisions regarding scheme layout, preliminary design and costings associated with construction. Pre-commencement discussions with the Local Authority and continued liaison throughout has ensured that evolving requirements of the client have been met within desired timescales. Recommendation provided have allowed the client to communicate effectively to prospective developers the likely further investigation requirements and remedial action to achieve planning consent and to enable detailed design. 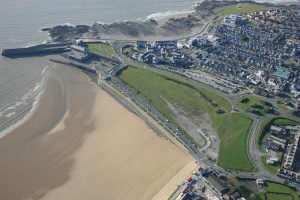 Bridgend County Borough Council are in the process of marketing new development opportunities for mixed-use schemes involving new commercial, leisure and residential uses for this former industrial site redevelopment at Porthcawl. The re-development forms part of the first phase of the wider sea front regeneration and is set within the adopted masterplan for the area (the Seven Bays Project Supplementary Planning Guidance, SPG, 2007). The initial phases of the redevelopment include areas of Salt Lake and Hillsboro Place Car Parks, which have experienced significant industrial development including the presence of a large historic dock, shipbuilding yards, railway stations, lines and sidings. Based on a detailed review of previous investigation information and a gap analysis between that undertaken and required based on the services requested, we designed a scope of works to satisfy both potential client requirements and likely regulator requirements as part of the planning process. This included future human health risks and degradation of the underlying Principal Aquifer (Carboniferous Limestone) and neighbouring bay. Historic features were targeted and delineated to allow the development of an updated conceptual model and spatial and preliminary quantitative assessments of soil, groundwater and gas contamination levels allowed recommendations for likely remedial requirements. Constraint maps have been presented to aid preliminary development design, considering the localised extent of features such as the former dock, underground services etc. and associated geotechnical considerations. Management and supervision of underground utility detection to ensure differing design team requirements were met. Provision of preliminary remedial recommendations and strategies for future investigation to allow detailed development design and full planning consent.